At the beginning this was supposed to be a banana cupcake with chocolate buttercream. I was absent-minded and I don’t know what I did but at the end I had a chocolate ganache and not a buttercream even if I put the butter. (Did I put it? I am sure I did). I was disappointed with myself but the more I am eating them, the more I like them! Mix the bananas with the crème fraîche together until very smooth. Add the eggs and the vanilla extract and mix well. In a mixing bowl, add the flour, sugar and baking powder. Then add the butter and the banana mixture. Mix slowly until well combined. Fill the cupcake cases with 2/3 of the batter. Bake for 25 minutes. Leave the cupcakes cool down before decorating. Melt the chocolate in a pan. In a bowl, mix the butter and the sugar. Then add the melted chocolate. 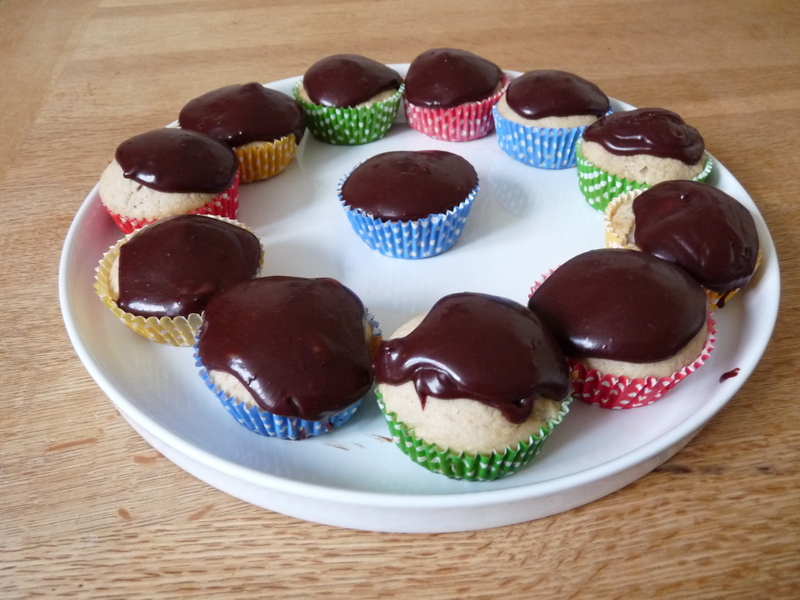 Cover the cupcakes with this ganache. This entry was posted in Cupcakes, Recipes and tagged banana cupcakes by thebloodyfrog. Bookmark the permalink.